A reckless NYPD officer hurt himself riding a dirt bike. The officer rode the bike without a helmet, blew a red light and almost collided with a car before loosing control of the motorcycle and crashing into another vehicle. The officer suffered a minor leg injury and was treated at a nearby hospital. Thankfully nobody else was injured in this motorcycle accident, however the incident is under internal review by the NYPD after a video went viral on the internet. 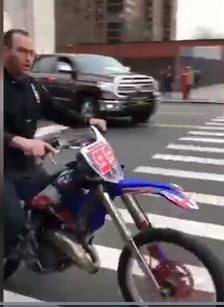 In the video the officer is seen getting on the bike without a helmet, popping a wheelie and then crossing the intersection of 135th Street and Lenox. The cop went right through the red light, not even looking for crossing cars or pedestrians. He almost got hit by a car and completely lost control of the bike as he tried to swerve around it. He then fell on the ground while the bike hit another car. Other police officers ran to the rescue. He was sent to the hospital to be checked. 10 motorists and 7 pedestrians died in NYC traffic accidents in October. No fatalities were recorded among cyclists and vehicle passengers. Truck accidents reached a record high while bus accidents were unusually low for October. Motorcycle accidents started to decline compared to the summer months as the temperature drops and bikers keep their motorcycle in the garage. 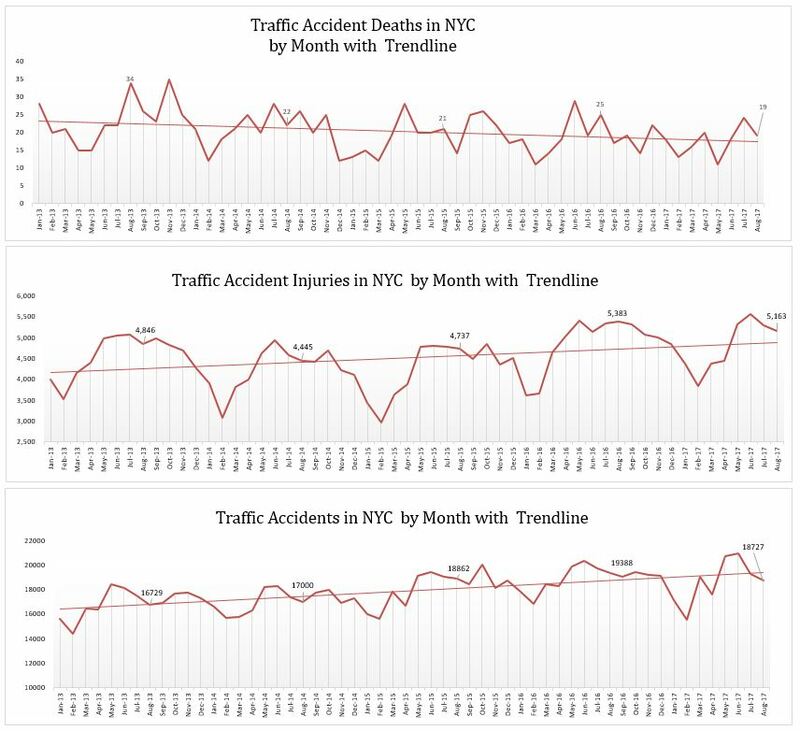 The total number of monthly traffic deaths continues to decline despite a rise in the total number of monthly accidents in the city. Traffic injuries continue to rise as well. Over the last five years while Vision Zero initiatives focused mostly on making the streets safer for pedestrians and cyclists, distracted driving has led to a significant increase in accidents injuries and fatalities. 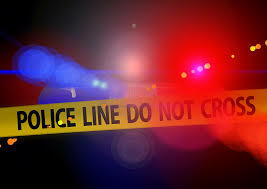 A 47 year old motorcyclist died in an accident in New York City on Saturday. 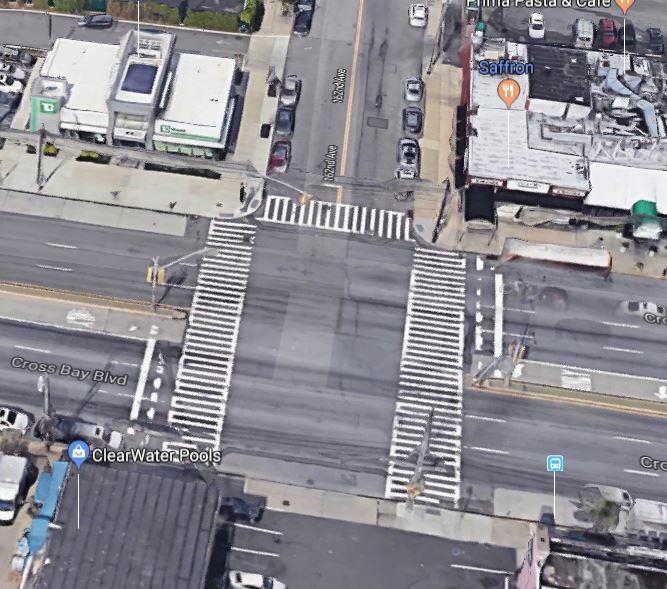 Around 4;15 pm, Julius Holloway was driving South on Mother Gaston Boulevard in Brownsville, Brooklyn, when all of sudden a car on the northbound lane made a U-Turn onto the southbound lane right in front of him. The motorcyclist didn’t have the time to brake and collided with the car. The car was driven by a 29 year old woman. 4 other occupants were in the vehicle including a child. The motorcyclist was rushed to the hospital but he couldn’t be saved. The car occupants were also transported to the hospital and treated for minor injuries. A motorcyclist was injured in a road rage accident on Wednesday morning on the west side of Manhattan, New York City. The motorcyclist and the driver got into a verbal argument. After that the enraged driver intentionally struck the motorcyclist with his SUV. The bike ended up mangled under the SUV and the motorcyclist was brought to the hospital to be treated for his injuries. He is expected to survive. The driver was arrested. The accident occurred on 57th street and 11th Ave.
15 people died and 5,450 were injured in 19,983 auto accidents in New York City in October. October is usually a bad month for car accidents in the city. 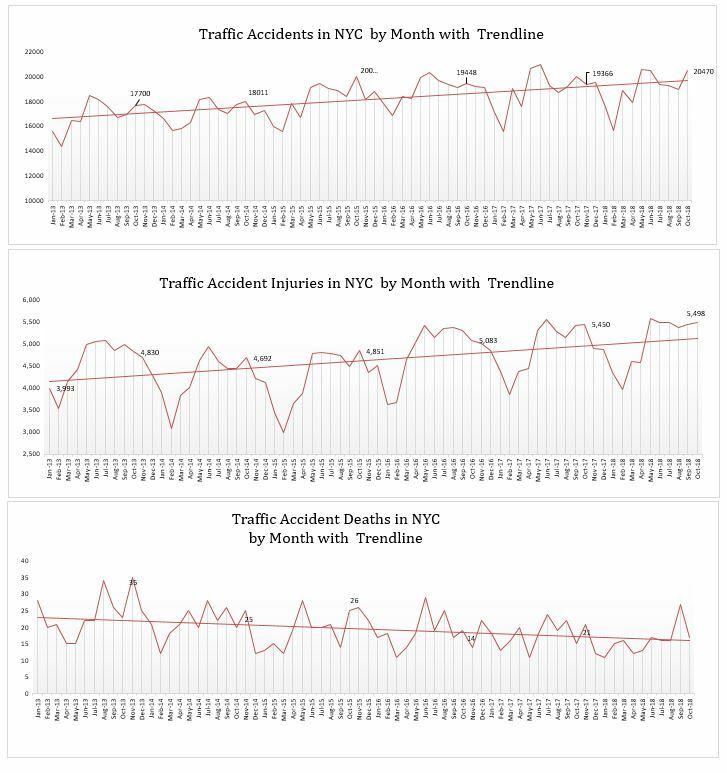 As shown in the graphs below the total number of accidents was above the trend line in October. The monthly number of traffic injuries was also the second highest number ever recorded in the city. The highest number of crash injuries was 5,557 last May. While the total number of crashes and related injuries have been steadily growing over the years, the number of people dying in crashes declined since 2013 when Vision Zero was launched. The number of people dying in car accidents went from 35 in October 2013 to 25 in October 2014, 26 in October 2015, 14 in October 2016 and 15 this last October. In 4 years fatal crashes declined by more than 50%. 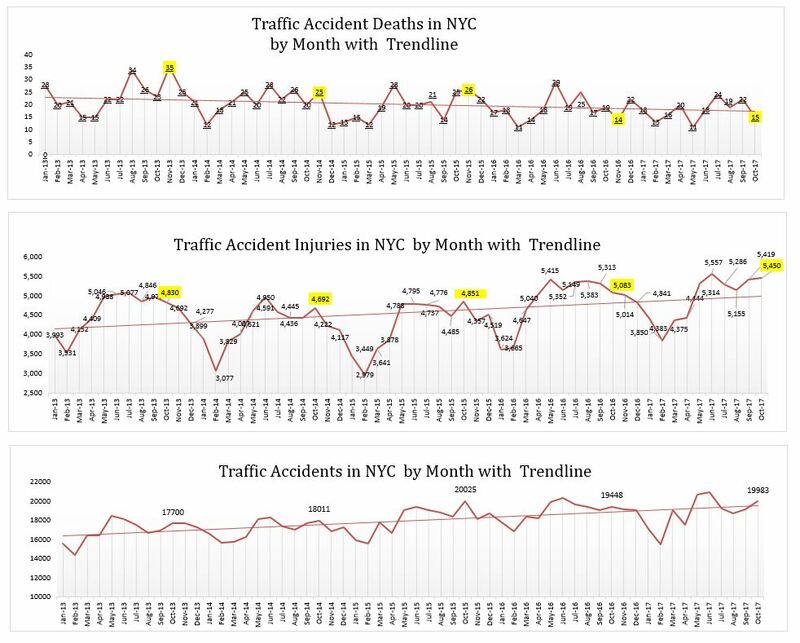 Additionally for the last two years the number of traffic deaths was below the trend line for the month of October while in the past it was always above it during this specific month. Despite all the Vision Zero efforts, crash injuries are on a rising trend. Since last May their monthly number stayed above 5,000. Motorist injuries are the main cause of this rising trend. While in October 2013 motorist injuries accounted for less than a third of the total number of injuries, four years later they account for almost half of them. On the other hand, passenger injuries have been declining over the last four years. Distracted driving is suspected to be a factor. When drivers are alone in their cars they maybe more tempted to use their electronic equipment than when they travel with passengers. The number of monthly deadly crashes in New York City stayed below 25 for more than a year. It is the first time that the number of monthly fatal accidents stayed below 25 for that long. The highest number was 24 in June followed by 22 in September. The last time this number was above 25 was in June, 2016 when 29 people died in car accidents in the city. The city speed reduction from 30 mph to 25 mph may have been a factor in the recent decrease in fatal crashes. Since Vision Zero started in 2014 fewer people are dying in traffic accidents in New York City but more and more are getting injured. Vision Zero initiatives helped decrease the number of pedestrian deaths and injuries however the number of motorists injured in car accidents in the city increased at an alarming rate over the last 3 years. 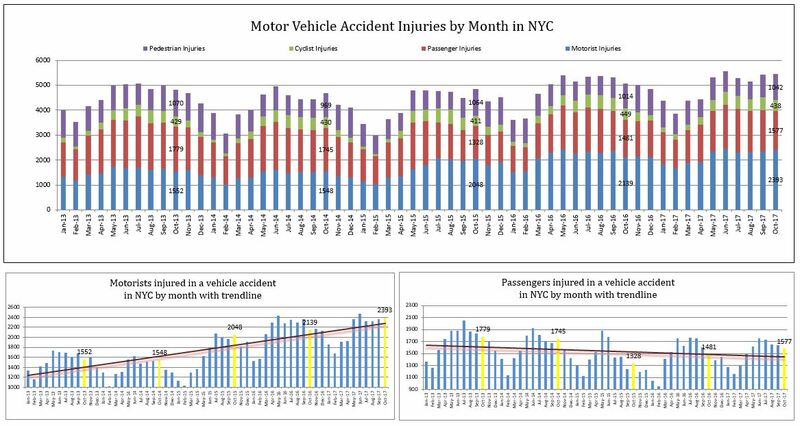 5,163 people suffered personal injury in motor vehicle accidents in New York City last August compared to respectively 5,383, 4,737, 4,445, 4,007 and 4,846 in August 2016, 2015, 2014 and 2013. Since the month of May the monthly number of people injured in traffic accidents stayed above 5,000. The same occurred last summer as well. Despite a decrease in both pedestrian and bicycle accident injuries over the last 3 years the total number of motor vehicle accident injuries continued to grow mostly due to a steady increase of motorist injuries over the last 3 years.